We’d been following the same storm since leaving Calgary and that was four hours ago. We, my girlfriend and I, were heading east on the 501 after turning off of Highway 2 at Cardston. We could have taken the shorter route via Highway 4, but it wouldn’t have been as scenic. The 501 is an isolated stretch of highway that winds its way through vast fields of crops and pastureland as it hugs the US border in southern Alberta. The storm leads us on to the agricultural town of Milk River and parts ways with us as we turn south on the 500 towards our destination, Writing-on-Stone Provincial Park. On the horizon is what looks like an optical illusion, mountains where prairie should be. The Sweetgrass Hills rise about 2000 metres out of the Montana prairies 12 kilometres to the south and 200 kilometres from the Rocky Mountains. The first time I saw the hills I thought I had taken a wrong turn. I thought I had somehow turned myself around and was heading back towards some strange part of the Rocky Mountain Foothills I hadn’t seen before. It took me a while to realize I was looking at the Sweetgrass Hills and those hills were stunning in contrast to the surrounding prairie. As I park the car at the Writing-on-Stone Visitor Centre, the vestiges of the storm roll to the north chased by an angry Sun. I say angry because it must have been pissed to heat things up so quickly. Temperatures can reach 40°C in this area; it’s not that hot, but it is pretty close to 30°C by the time we get out of my car. The air is hot and dry and carries the sweet smells of grass and sagebrush. 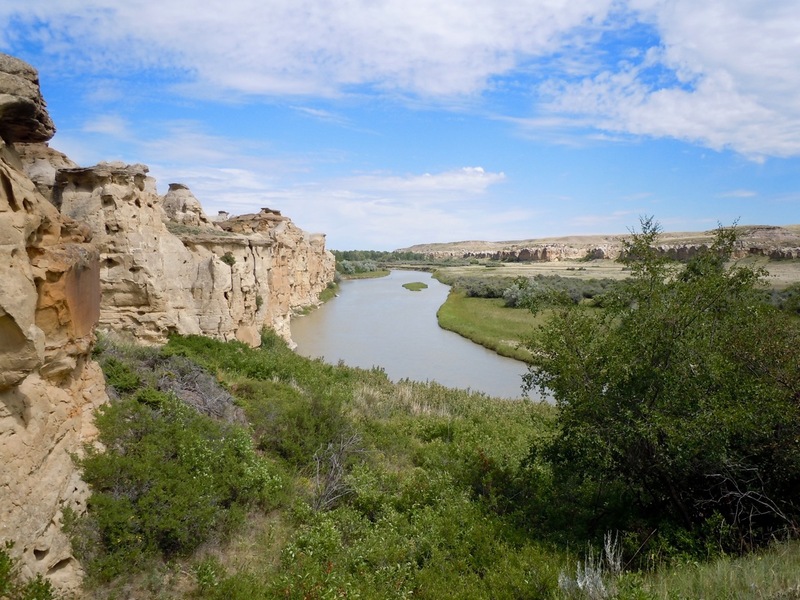 Before us is a beautiful and exotic landscape filled with hoodoos, coulees, sagebrush, and willows that line the serpentine Milk River. The hoodoos are mushroom-shaped sandstone formations that have been slowly eroded by the elements since they were exposed at the end of the last glacial period around 11 500 years ago. They are usually light brown in colour, but some can have veins of black, dark brown, yellow, grey and red. 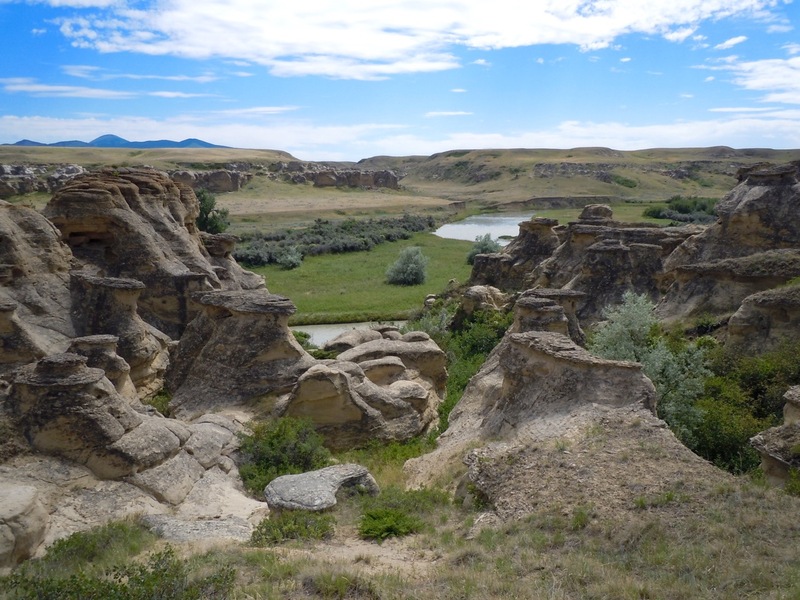 Across the valley are steep ravines or coulees that bring melt water to the Milk River. The coulees and river valley are green oases surrounded by semi-arid grasslands on the planes above that stretch out to the horizon and merge with the Sweetgrass Hills to the south. The smells, shapes, colours, and coulees create a stunning and numinous landscape. In the foreground are hoodoos along the Milk River valley in the midground. 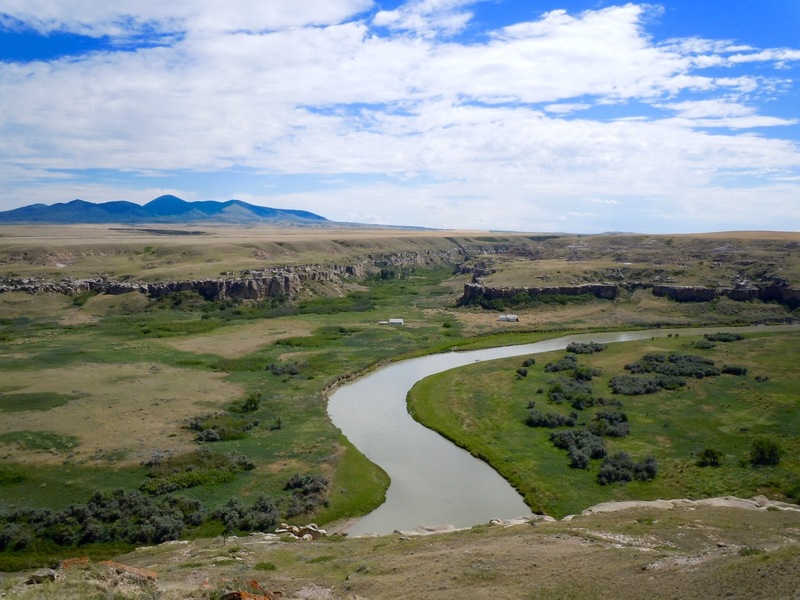 The opening of a coulee is in the centre of the image, just above the Milk River, and the Sweetgrass Hills are in the background on the left. Photo by Rodney Steadman. We decide to visit the information centre before we explore the hoodoos. Once inside, we are met by a young woman in her late teens or early 20s, wearing the dark brown uniform of Alberta Parks, sitting behind a cash register in front of a small gift shop. It looks like she’s spent a little too much time in the sun. Not a hard thing to do in this area. She asks us if we want to see the rock art and, of course, we say yes. She highlights the areas on a map in a pamphlet and tells us the trail starts behind the visitor centre. We look at some of the exhibits before we go. The centre is fairly new, built in 2007, and officially called the Writing-on-Stone/ Áísínai’pi Visitor Centre. Áísínai’pi is the Blackfoot or Niitsítapi word for the Writing-on-Stone area and it means, “it is pictured/written.” According to research by James Opp from the University of Carleton, the centre was created in consultation with Niitsítapi elders and the Mookaakin Heritage and Cultural Society – this society is affiliated with the Kainai or Blood Nation and the Kainaa are one of three tribes that make up the Blackfoot Nation. The centre’s design was influenced by the tipi, a traditional shelter created by the Niitsítapi, with a circular design and eastern entrance. This was a big step for both the Alberta Government and Niitsítapi in the area because, according to Opp, the Niitsítapi have not felt welcome at the park in the past; however, they have been allowed to practice their ceremonies in the park for several years. Áísínai’pi is an important place to the Niitsítapi. According to the Alberta Parks website, and information at the visitor centre, people have been visiting the Áísínai’pi area for at least 3 000 years. It was a place to hunt bison, collect plant foods, gather materials to build tipis and travois (a wooden structure used to transport goods and belongings), take shelter in during the winter, and conduct important ceremonies. At some point in time, people etched and painted on the sandstone outcroppings – there are 85 locations in the Park that contain rock art, but very few are accessible to visitors in an effort to protect the remaining rock art from vandalism and graffiti. To the Niitsítapi, these are the writings of the spirits. However, it’s not just the writings, but the area as a whole that has spiritual significance to the Niitsítapi. I know very little about the Niitsítapi’s belief system, about as much as I know about their cultural past and present, therefore, I don’t feel comfortable discussing something I don’t know or understand. I can’t say it any better than Opp when he wrote, “The Niitsitapi/Blackfoot understandings, ways of knowing and experiences of place are larger stories which are not mine to tell.” Here’s a collection of YouTube videos created by the Niitsítapi that show their dances, songs, and links to videos they find important to their culture. The centre does go a long way in providing information on the Niitsítapi’s traditional life with exhibits ranging from a large centre piece representing the inside of a tipi with bison pelts for comfort and warmth to historic and prehistoric artifacts. European settlement is also exhibited with the main focal point being a reproduction of a Northwest Mounted Police (NWMP) cabin that sits at the mouth of the aptly named Police Coulee. According to the pamphlet we were given when we entered the centre, the post was originally built in 1887 to stop whisky traders from selling rotgut whisky to the Niitsítapi. The traders would enter Canada through Police Coulee, hence the building of the cabin at that location. It was part of an initiative by the Canadian government that began in 1874 with the historic march of the NWMP into the Wild West to shore up Canada’s borders and establish law and order. Northwest Mounted Police cabins are in the centre midground above the Milk River. The Sweetgrass Hills are in the background on the left. Police Coulee is in the centre midground above the cabins. Photo by Rodney Steadman. This is the history I learned while growing up in Alberta, but this history is always told from the European perspective. I do find it interesting that the Kainai do not mention this “significant” part of Alberta’s past in the history section of their website. Sure, it could be mentioned in other histories written by the Kainai, or a simple oversight, but I believe it is a purposeful omission because their experiences of the past are very different than that of the colonizers and their website reflects this perspective. The Niitsitapi/Blackfoot understandings, ways of knowing and experiences of place are larger stories which are not mine to tell. My girlfriend and I head out to find the interpretive trail and we become immediately lost. We were told to follow the trail behind the centre, but we didn’t know there was more than one trail behind the centre. We find ourselves in a maze of hoodoos and every trail ends in a drop-off overlooking the campground. It’s not like the drop-offs are thousands of metres of vertical cliffs, but high enough to break a leg. So we spend about 15 minutes searching the maze until we find a big, wide trail that can’t be mistaken for anything else but the interpretive trail. Always follow the big trail. 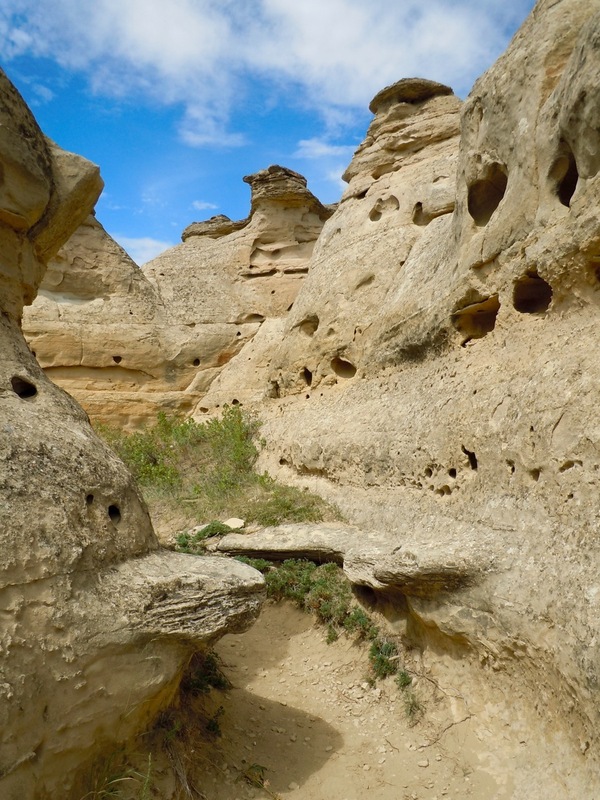 Walking through a maze of hoodoos in Writing-on-Stone Provincial Park, Alberta, Canada. Photo by Rodney Steadman. We walk along the trail and stop at markers that coincide with the pamphlet. We read about how the area was formed, and the belief systems of Niitsítapi. We read about the Sweetgrass Hills (Katoysis to the Niitsítapi) and its importance to the Niitsítapi as a place where young men would go for their vision quests or to watch for bison. We read about the plants and wildlife that make the area a virtual oasis in semi-arid grasslands. The trail leads us down through the coulees to where the sandstone cliffs tower over the lush green valley of the Milk River. Sandstone cliffs along the Milk River in Writing-on-Stone Provincial Park, Alberta, Canada. Photo by Rodney Steadman. Then we see the writings on stone. They are barely visible. Due to the light being high overhead, we can only see what looks like a hand (according to the visitor centre, it represents a bear claw), but the other etchings are difficult to make out. The pamphlet talks about how the bison and bear were sacred and speculates about how the Niitsítapi elders carved the images as part of a ceremony. I don’t know if this assumption is right or wrong, but I do know that for what ever reason someone in the past decided to create a work of art to express his or her ideas, feelings, emotions, or just decided to doodle away an afternoon. What those original intentions were have been lost to time, but, like all great art, it was meant to elicit an emotional response and that response is further amplified by the setting of the art: you have to be there, in nature, to have the experience. I believe the artist chose this location for a reason. He, or she, knew that to view the art, you would have to be standing in a specific location that provided specific views of the area. Maybe he even thought about how the art would change with the seasons, time of day, or even how the sounds and smells down in the valley close to the water’s edge could influence the viewer’s experience. It’s not just the art that’s important, it’s how it changes the space and place from one that is purely natural to one that expresses a human’s experience of nature while being in nature, and, as I have discussed in previous blogs (Nature Helps, Does Nature Influence How We Think?, What is Nature?, and Treezac), being in nature has a variety of positive psychological benefits. Maybe it’s these benefits that contribute to the spiritual qualities of this place? Like all great art, this art makes me think. What does it make me think? I would rather not say. I don’t want to share my thoughts for fear of insulting the Niitsítapi’s interpretations of their ancestors’ creations or influencing others when they visit the area. I will say that I understand why the artists chose this area to make their creations. It is a special place and I believe they were trying to tell everyone how special it was on a personal level. They knew the power of art in nature. I encourage you to visit the area and immerse yourself in the landscape. Spend time experiencing the nature around you before viewing the writings on stone. Try to view the writings without any preconceived notions. Clear your mind and let the art do all the work. You might be surprised where it leads you.